Yesterday GeekMom Judy pointed out an article on Yahoo News about the U.S. National Oceanic and Atmospheric Administration (NOAA) issuing a formal statement denying the existence of mermaids. Because it came out of NOAA, it was routed in my direction for commentary. It appears that NOAA had to issue the statement as a reaction to the public’s reaction to a Discovery Channel documentary about mermaids that ran during Monsters Week. Read the Yahoo News article here, and the original NOAA statement here. The original NOAA statement is using a picture of one of the Norfolk, Virginia “Mermaids on Parade” works of art. The city commissioned artists, mostly through corporate sponsorship, to decorate mermaids. This brought back memories of my own 2007 tour of Norfolk’s mermaids with our oldest son. I love writing for GeekMom! The Norfolk Mermaids blog offers more pictures than what I have. Want to see a Norfolk mermaid creation from start to finish? Check out Exocubic Studio’s blog about their 2009 stainless steel mermaid. My oldest son and I were obsessed together. He enjoyed seeing the variety of colors and creative locations throughout the city, and I really enjoyed the variety of art media and incredible creativity. My favorite is named called “Go Diva” (best. pun. ever.) and she looked like a chocolate bar being unwrapped. The last I heard she was living in a fountain at the MacArthur Center Mall in downtown Norfolk. Since the project began in 2000, these mermaids have undergone quite a bit of movement around the city, theft, vandalism (such as on the “Maid in Time”‘s forehead), and need for restoration. But the idea was great and it did wonders in beautifying the city. The mermaid now grace’s Norfolk’s unofficial city flag and advertising brochures. And in typical GeekMom fashion, my thoughts about mermaids and Norfolk’s mermaid art got me thinking about the numerous other cities in America that have used city symbols as a vehicle for artists to show their creativity. I’ve seen them in many of the cities I’ve visited, and I know there are many more. This website attempts to keep up with community art projects worldwide. 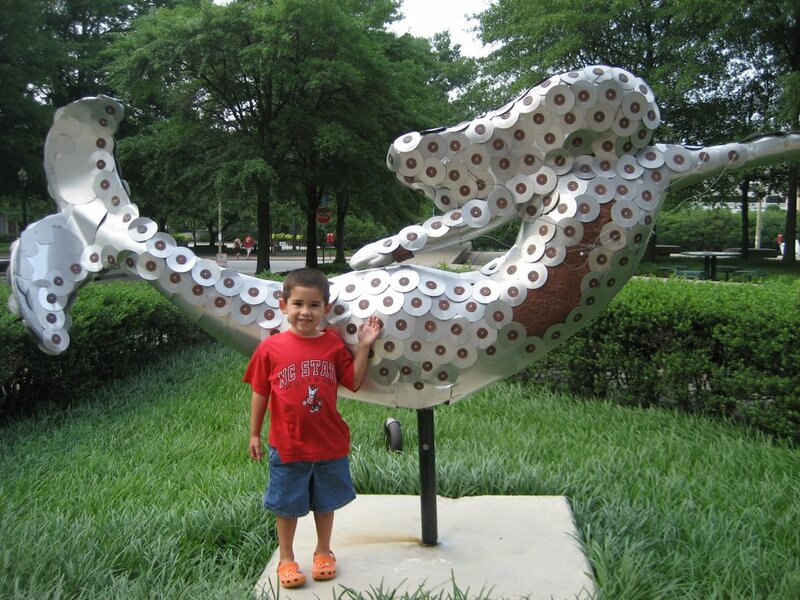 This can be a great way to explore a city you’re visiting, particularly with kids: see if the city has a map or scavenger hunt of the sculptures. The art is typically auctioned off as a charity fundraiser and you may or may not see the art still in the cities. Some cities, such as Cleveland, Ohio, conduct the art project over and over again, keeping the ideas and creativity fresh. Here are some examples. If your city, or a city you’ve visited, has an active community art project, please feel free to share it in the comments!